No matter what the score is, give Superbowl fans something to cheer about with great food, and plenty of it. These simple, delicious recipes are easy to make, which means you can sit back and enjoy the game with everybody else. 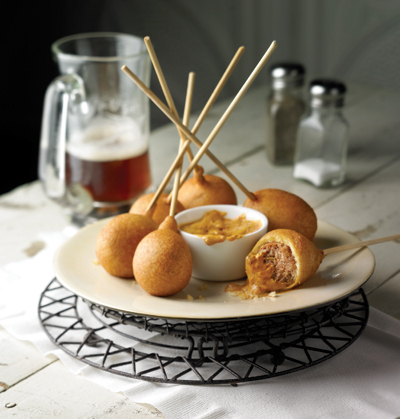 For more recipe ideas to make your game day party a winner, visit www.johnsonville.com. Cook sausages according to package directions. Allow to cool slightly and cut each sausage into 4 pieces. In a medium bowl, mix all dry ingredients for the corn batter then mix in wet ingredients. Pour oil 2 to 3 inches deep and bring to medium heat or about 350°F. Place one sausage piece on the end of each skewer. Dip into the batter and coat the sausage completely. Carefully submerge the sausage into the hot oil while holding the end of the stick. Fry each sausage for about 1 minute, until the batter is a deep golden brown. Serve with Remoulade Dipping Sauce or your favorite mustard. Combine all ingredients except oil in a food processor and process for 30 seconds. With the motor running, slowly add the oil through the feed tube and process until thickened. Transfer the sauce to a bowl, cover and refrigerate for at least one hour before serving. 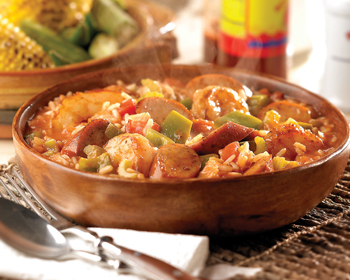 In a large saucepan, saute onion, pepper, celery and jalapeno peppers in oil until crisp-tender. Add sausage and garlic; saute 1 to 2 minutes longer. Add tomatoes, water, tomato paste and seasoning; bring to a boil. Reduce heat; cover and simmer for 15 minutes. Preheat oven to 350°F. In a bowl, combine sauce ingredients. Cover and refrigerate until serving. Slice French bread lengthwise and transfer to a baking sheet. Arrange brat slices on bread bottom. Bake at 350°F for 10 minutes or until bread is lightly browned. Remove from oven. Top with the sauce, onion and tomato. 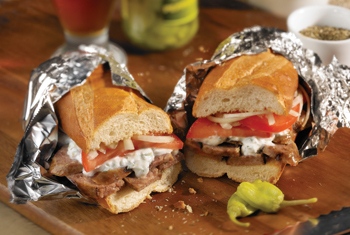 Cut hoagie and serve.